From the obvious (bikes!) to the handy, there are a few things to consider when equipping yourself and your kids for cycling. There is something so exciting about buying your child their first bike. It evokes all kinds of memories from our own childhoods. For a child the gift of a bike is almost magical. Their first two wheeler represents another of childhood’s hurdles to be conquered and a link in the chain that brings them closer to that far-off world adults inhabit. Whether you are stripping rust off a junk shop find, or unveiling a sparkling new marvel from the bike shop, you will love the look on your child’s face when they encounter a bike that is all theirs. So how do you go about making such magic happen? It’s about timing and selection: the right bike at the right age/stage. The right bike: when to go to two wheels? A number of factors that will determine what kind of bikes you child will ride, how and when they will be ready for two wheels, and whether training wheels are a good approach or not. Personality. Some kids need more support and ‘scaffolding’ as they acquire new skills, others just want to do it for themselves. Position in family. Oldest and ‘only’ children might need more help than their counterparts with older siblings, and may develop skills later. Second and third children are in much more of a hurry to learn, and have a greater sense of what kids are capable of. I’ve seen the fourth child in family jump onto a friends two wheeler at a BMX park and ‘learn’ to ride it in 15 minutes. Parental capacity. Some parents won’t be up for hours spent bending over being human-training-wheels, and will prefer the mechanical sort. How you choose to teach your child to move onto two wheels needs to reflect your own capacities else it will be unpleasant (and possibly injurious) to you and your child. It really does take all kinds, so make your approach flexible and supportive, and try not to compare to what other kids are doing. Your kids will be observing and comparing themselves, and will use that as their motivation if it suits them and when they are ready. Shaming them won’t help them feel confident, just as shaming a grown up doesn’t help them learn faster or better. Do what works for you and your child. Experience. As a cycling couple we were so eager to get our son onto his first bike. 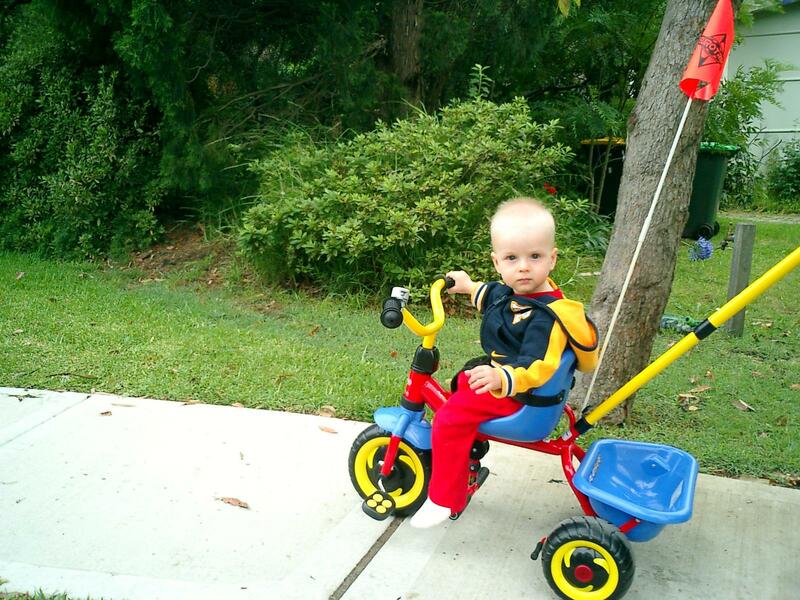 It was a Christmas present when he was 14 months old: a tricycle with a seat belt and handle so we could push it. I’m not sure who was thrilled more, him or us! At three he moved onto a bigger tricycle, and at four we gave him his first two wheeled bike, with training wheels. Fast forward to our second child. Keen to be part of the action she was climbing onto our bikes in the garage before she could walk. By that time we’d acknowledged that balance bikes were not just a passing fad, so got her one when she was two. She loved it! It gave her freedom without the complexities of coordinating balance and peddling, and she could go so much faster than the trike. She even did 3 km beginner mountain bike circuits on it. When she was ready she moved to a 12 inch wheel bike, with training wheels. In hindsight maybe we should have skipped the training wheels, as she became dependant on them. However, when she decided she was ready, she ditched the training wheels in a single afternoon. Tip: We found our local toy library a handy way to try out different sizes and styles of bike. Kids bikes vary by wheel size. Typically the wheels start at 12 inches, then move onto 16”, 18”, 20”, 22”, and 24”. Usually 26” wheels are what you find on an adult size mountain bike, however these days there are lots of variations including 27.5” and 29”. Adults bikes vary by frame size and an extra-small (XS) adult bike will fit some older/taller children. It is important that your children have bikes that are suitable for their size. Although it is tempting to buy a too-large bike that they will grow into, the most important consideration is safety. A child on a too-large bike may not be properly in control of his/her bike and more likely to come unstuck. Similarly, for all of us, the right size and set up is essential to comfort. Your local bike shop can help advise on size. The second-hand marketplace is a great option for moving through the bike size range for your kids. It is advisable to get any second hand bike safety checked by your bike shop. Experience. Our son has had 16” and 20” bikes. He is very tall for his age, and on the advice of our bike shop his third two wheeler is an adult size 26” wheel bike with an extra-small frame. It is serving him well, although to begin with he did look like Kermit the Frog riding a bike in the ‘Muppets Movie’. Smaller two wheelers will usually be ‘single speed’, meaning they have no gears. They are also usually back-pedal braking, which means the rider moves the pedals backward to brake. This is handy as a child’s hands often are not strong enough to manage handlebar brakes, and they can have trouble knowing which brake is for the front wheel and which is for the back. Braking hard on your front wheel can cause it to stop whilst the rest of the bike, including rider, keep going in a spectacular somersault; scarey. Whether you are maintaining and safety checking your bike, shopping for a bike, or getting your bike serviced, it is helpful to know some of the terminology. Front suspension forks. On mountain and comfort bikes, the front forks may have shock absorbers built into them. These sit on either side of the wheel and allows the handlebars to remain somewhat steady while the front wheel moves up and down over the terrain. What it means for the rider is that your hands and upper body get jarred less when you are traveling over an uneven surface. This increases comfort and decreases fatigue. V-brakes. Named after a V shaped bracket that holds brake pads in place alongside the wheel rim. When you squeeze the brake lever on the handlebar, the brake pads push against the wheel rim, slowing/stopping the movement of the wheel. Checks and maintenance are required of the brake pads and cables. Disc Brakes. A disc is attached to the wheel near the centre of the spokes. When the brake lever is squeezed, a pad attached to the fork ‘grabs’ the disc and causes the wheel to stop spinning. On the whole disc brakes are more powerful and lower maintenance than v-brakes. Fat Tyres. A current trend in mountain bikes are ‘Fatties’ or fat tyred bikes. These tyres more closely resemble motor bike tyres in size and inflation. They are meant to give a softer and grippier ride, particularly on soft surfaces like sand. Lots of people love them, but be warned, there is a lot of effort in hand pumping up one of those tyres if you get a flat out on the track. Knobblies. Wide tyres with a deep tread pattern designed for good grip on muddy and rocky mountain bike tracks. Slicks. Smoother tyres designed for on-road use. Putting slicks onto a mountain bike makes it faster for commuting and sometimes more puncture resistant too. Brazons. These are mounting points on the frame into which you can screw in accessories like racks, bottle cages, etc. Cluster. This is the set of toothed circles (called chainrings on the front and sprockets on the rear), grouped in size from large to small, around which the chain travels. Some bikes have front and rear clusters, and others have rear only. If there are two clusters there will be a gear lever on each side of the handlebars. It is the combination of where the chain is on each cluster that determines which gear you are in. Chain. The chain is made up of metal links joined by pins, and it turns as you pedal. As the chain turns it connects with the sprockets attached to the rear wheel (fixed gear bike) or rear cluster (geared bike). This causes the rear wheel to turn. Hub Gears. When you cannot see a cluster and derailer but the bike has gears, then this means it has hub gears hidden away in the rear hub. These are durable, efficient and long-lasting. Single Speed. A bike with no gears but has the ability to free-wheel (which means the wheels can turn without having the pedals turn). Fixie. A bike with no gears and no free-wheel. The chain is affixed to the the rear wheel, so even when you are not pedaling the pedals will still be turning if the wheel is turning. On a non fixed wheel bike you can free-wheel, meaning you can go downhill without pedalling. ‘Speeds’ e.g. 10 Speed, 21 Speed, 27 Speed etc. This is about the mathematics of the number of cogs on a chainring. It is effectively the number of combinations you can achieve by adjusting your gear levers. E.g. a bike with three chainrings and seven sprockets has 3 x 7 = 21 gear ratios. This is what is referred to as 21 speed. Bike Maths: If a bike only has a rear derailleur, then the bike’s “speed” equates to the number of sprockets on the rear cluster. If a bike has both front and rear derailleurs, then it is the number of chainrings on the front multiplied by the number of sprockets on the back. Kickstand. Although these vary a lot in their strength and functionality, the basic premise is that it will hold your bike upright when you want to park without having to lean it against something. This can be a good alternative to laying a bike down – which takes up more space and makes the bike vulnerable to damage – not to mention being tripped over or run over! Mud Guards. Also known as fenders. These handy guards fit to the bike frame between the tyre and the rider. A rear one helps prevent that tell tail v-shaped spray of mud/water seen on a rider’s rear during the wetter months. A front one can prevent spray from the front wheel flicking onto the rider’s face/front/arms. It can be hard to find ones that fit smaller bikes, so if the bike comes with them all the better. Racks and baskets. A rack or basket is great for a child to carry their favourite toy, library book or a drink bottle. On a child’s bike they are fairly lightweight and won’t carry much. They can have surprisingly short lives so don’t pay a lot extra for them. Although extras like kickstands and mud guards are handy, they all add to the overall weight of the bike, which is why you won’t see them on a racing bike, or in a sports oriented bike shop. When your child moves up a size of bike, they can feel quite uncomfortable at first. Initially you may need to start with the bike adjusted smaller than in the guide above, then gradually adjust it to a proper fit as they get used to the bigger bike. Be prepared to go back to the old bike if they are not safely in control of the new one. Give them time to get used to it in small doses in a controlled environment like a bike park.